In this article, I will briefly explain on how to create a Python class library to interface with LCD 5110 display module and shares the common APIs with the Arduino LCD5110 library that I previously created. I won’t spent too much time on how the LCD 5110 display module works as it has been discussed in great details previously. I would suggest that you read the article How to use LCD5110 (PCD8544) with Arduino first to get familiar with the LCD 5110 display module or PCD8544 LCD controller before reading this article. For those Raspberry Pi with 26-pin P1 header, only one SPI interface is available with two chip enable pins. For those with 40-pin P1 header, two SPI interfaces are accessible via the P1 header. 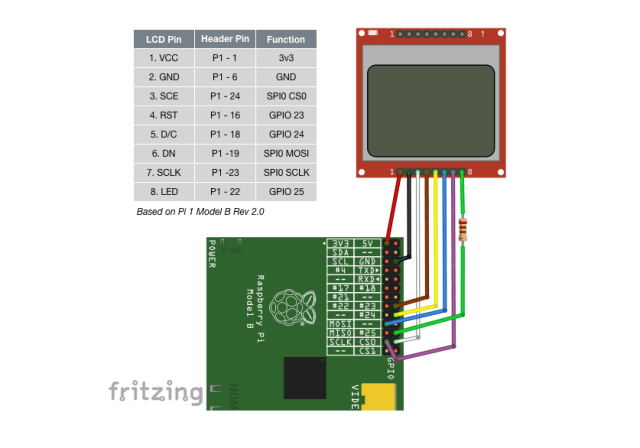 We will use SPI0 which is available for all Raspberry Pi models for interfacing with LCD 5110. CE0 (Chip Enable 0) on Raspberry Pi is used to control the SCE(System Chip Enable) pin of the LCD module. Once pip3 installed, we can now install python packages that are need for GPIO and SPI communications. RPi-GPIO is a python package that provide a class to control the GPIO pins on Raspberry Pi. Spidev package provide an API interface for using linux spidev kernel driver. SPI was disabled by default on Raspberry Pi, we need to activate it either via raspi-config configuration tool or by modifying the /boot/config.txt file directly. Navigate to 5. Interfacing Options and press Enter on the keyboard, and select P4 SPI to activate the SPI. Alternatively, you could activate SPI by editing the /boot/config.txt file directly. Save the file. Reboot the raspberry pi no matter which way you chose to make the change. We are now ready to do our programming. I created an Arduino library in the previous article with a set of APIs for communicating with LCD 5110. There is also a private function (or method) _write(mode, ch) which is not part of the public APIs. With this, we can create a python class library skeleton to match the Arduino APIs before we start filling the code for each API. Create a file call lcd5110.py with the skeleton shown below and save it at home directory (i.e. at directory ~ or /home/pi/, or the /home/username if you have change the default user name from pi to a different username. The most different part between Arduino sketch and Raspberry Pi code in python are related to how the GPIO and SPI been setup. Python’s class construct __init__() is equivalent to Arduino’s setup() where you put the declaration of all the properties and parameters and codes related to device initialisation. There are two ways of numbering the IO pins on a Raspberry Pi within RPi.GPIO. GPIO.setmode(GPIO.BCM) refer each GPIO pin based on Broadcom’s SOC (System On-chip) assignments; GPIO.setmode(GPIO.BOARD) refer to the pin numbers on the P1 header of the Raspberry Pi board. I personally prefer to use GPIO.BOARD naming convention because it is always works no matter which Raspberry Pi model you are using. We explicitly set RST, DC , LED and CE0 pins as output lines. We don’t have to do the same for SPI pins (MOSI and SCLK) as it will be initialised by spidev library. RPi.GPIO would generate a warming message whenever it detects that a pin has been configured to something other than the default mode (input). We use GPIO.setwarnings(False) to suppress the warning message. [0x00, 0x00, 0x5f, 0x00, 0x00],   # 0x21, ! [0x00, 0x07, 0x00, 0x07, 0x00],   # 0x22, "
[0x00, 0x60, 0x60, 0x00, 0x00],   # 0x2e,. [0x02, 0x01, 0x51, 0x09, 0x06],   # 0x3f, ? We will create a separate file called example.py to write the example program for testing the LCD5110 class library. The program import the library, and create a class instance lcd, the rest of the code is very much similar to the Arduino code, it prints 3 strings at different locations of the screens, with the last string in inverse mode, it will then wait for 5 seconds and turn on the backlight, and print the e-Tinkers logo image, and wait for another 5 seconds before turning the backlight off. Now you can write program to use LCD 5110 for both Arduino and Raspberry Pi, in Python (for Raspberry Pi) or in Arduino Sketch. All you need is to include or import the library, but the APIs for both platforms are almost identify. The complete library can be download from my github repository.